The Laura Foundation for Autism and Epilepsy | Enriching the quality of lives of individuals with autism and/or seizure disorders. The mission of The Laura Foundation is to provide funding to develop and support therapeutic recreation and educational programs that enrich the quality of lives of individuals with autism and/or seizure disorders. The Laura Foundation is currently finishing the construction of an adaptive sports and recreation center in the Mount Washington Valley. 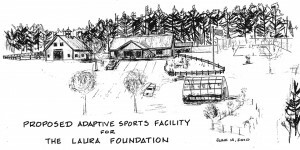 Thanks to fundraising efforts from grants, donations, and event income significant strides have been taken towards the development of the Laura Center. In fact, as of spring 2014, Phase 1 of the construction process – modifying an existing building at the site – was complete. The main building at the Laura Center now includes bathrooms, a kitchen facility, increased dedicated space for year-round programming, as well as space for storage. Aside from the main building, an outdoor arena for therapeutic horseback riding has also been completed. Phase 2, the construction of a multi-purpose barn, is complete. The barn is a versatile, four-season facility on its own with a climbing wall, a multi-purpose court, adaptive sports equipment, and two horse stalls. Phase 3 will wrap up the Center’s construction (commencing late summer 2018). This will include a paved bicycle path, and the expansion of the facility’s existing botanical area (complete with a greenhouse) for therapeutic gardening.